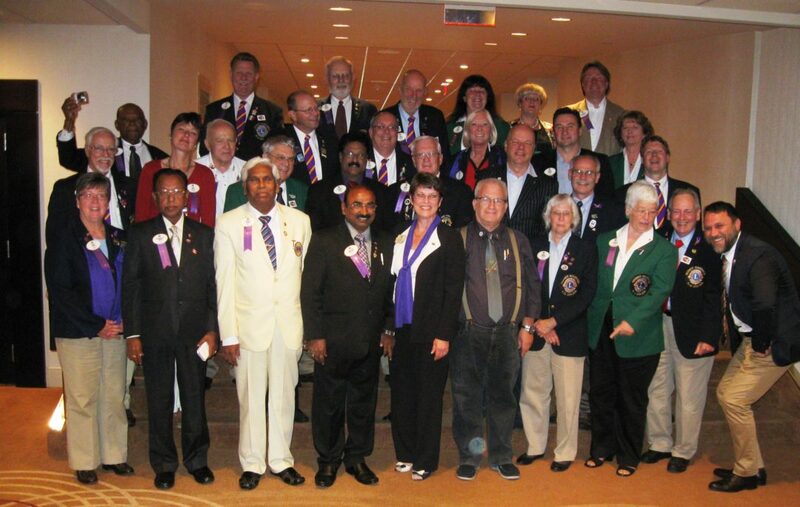 The International Lions Convention was held in Toronto Canada from July 4 – 8. 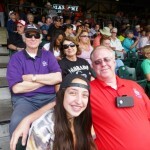 Lions Faye and Ron Lockner and Bob and Carole Kitchell attended. Toronto is a very large city, about 4 ½ million people. Faye’s and my hotel, the Weston, was located on the shores of Lake Ontario. Our hotel was a short walk from the Convention Center and the Air Canada Center. The Air Canada Center was where all of the large meetings were held and the Convention Center was the location of registration, displays, information booths, pin trading, and served as a gathering place for the fifteen thousand Lions from around the world. July 4th, the first day of the convention, is a day to get registered, see the displays in the Convention Center, and meet fellow Lions and friends from around the world. Faye and I took a tour of Toronto. In the evening we attended the International Show. The show featured Neil Sedaka, the famed songwriter and entertainer. Neil performed and entertained us singing many of his famous songs for about 90 minutes. July 5th is the day of the International Lions parade. Lions from around the world dress in their native costume and march the parade route. This year the Colorado unit was 35th in the line of march, so when we finished the route we were able to join the spectators and watch the many Lions units and admire their costumes. July 6th, 7th and 8th are the three days the planetary sessions are held. Each day at 10 AM Lions gathered for the day’s session. Day one is the report from International President Barry Palmer and his year of traveling the world representing the Lions of the world. 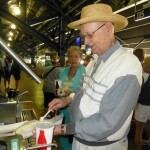 Lion President Berry spent more than 300 days this past year in his travels. The session ended with the parade of flags of the nations of the world. Day two is the report from Immediate Past President Wayne Madden and the activities of the Lions Club International Foundation. The last day of the International Convention is dedicated to the induction of new International President Joe Preston, the introduction of the first and second vice presidents and the new members of the International Board. At the very end of the session International President Joe Preston installed the new District Governors. It was great to be standing behind Lion Bob Kitchell as Lion Carole removed the ribbon from his name tag and he became our new District Governor. It was a great experience for Faye and I to attend the International Convention in Toronto, to have an opportunity to see our Lion friends, and witness the installation of Lion Bob as our new District Governor. If ever you have the opportunity, we highly recommend you consider attending and international Convention. 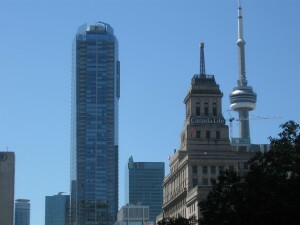 Toronto, Ontario was the site of the 2014 Lions International Convention held July 4-8. 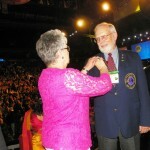 15,000 Lions from all over the globe were in attendance as our new International Director, Joe Preston (Arizona), was officially introduced and took the opportunity to acquaint us with his vision for Lionism. For the Coloradoans present, however, the most memorable moment occurred when our district’s four District Governors — Lion Bob Kitchell (6NE), Lion Sandy Smith (6SE), Lion Carl Gentzel (6C), and Lion Lyndel Silvertooth (6W) were installed as District Governors. CONGRATULATIONS!!! 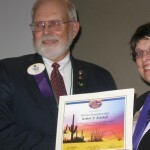 To 6NE District Governor Kitchell – we look forward to working with you! 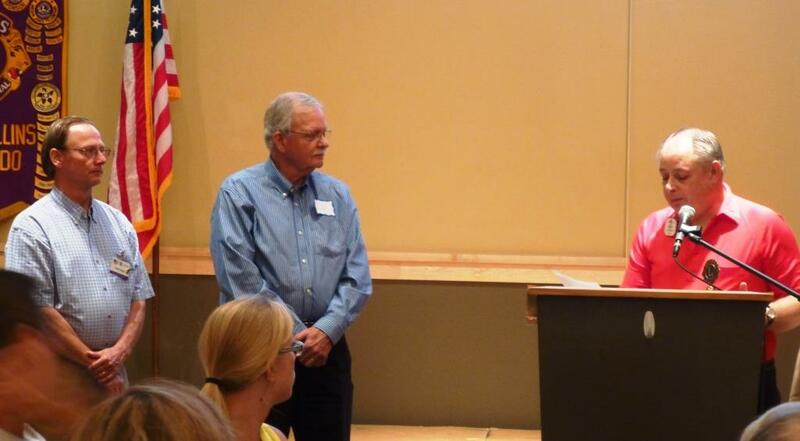 New member, Dale Edwards, sponsored by Tobey Yadon, is inducted into the Fort Collins Lions Club by Ron Lockner. Fossil Creek Park – EAST entrance then walk down to pavilion. Bring potluck sides and desserts. Sing-along and Bingo with prizes. Because you will be bringing a potluck dish of your choosing, there will be no charge for you or your guests – bring them along just for the fun of it. Sign up at club or RSVP to Alex Chapman. With the new school year just weeks away, our KidSight vision screening program is about to begin and we’d love to have you join us! It is a rare opportunity for you – it’s possible that our KidSight screening could change the life of a child(ren) but our devoted volunteers need some help from you. It requires little time and NO $$$. If you’re interested, please talk with me, Carole Kitchell, at club or call me. Please volunteer with Lion Bill Funke. 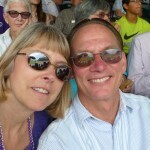 Bill will have a sign-up sheet at club, or call him for more information. Bingo became our major fund raising program in February 1994, and has considerably increased the funds available to support our charitable programs and activities. Through these 20+ years, many past and present Lions have worked Bingo. 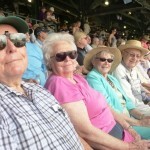 They have a good time interacting with fellow Lion volunteers and with our “clientele”, the Bingo players who come back, week after week, to play Bingo with the Lions Club. 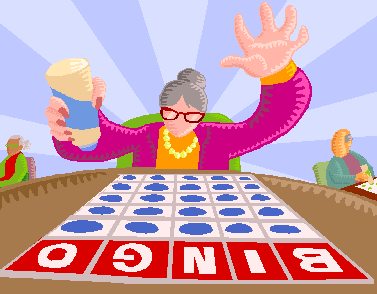 Our Lions Club operates two Bingo sessions each week – Tuesday evening starting at 7:00 PM and Friday morning starting at 11:30 AM. Each session runs a little over 2 hours. 11 or 12 Lion volunteers put in additional time setting up, selling bingo packets, specials, and pull tabs (called “pickles”) before the session starts; and, cleaning up the hall, selling pickles for 30-45 minutes after the session, completing the required paper work for the Secretary of State and then putting everything back in our storage locker. Bingo Chairman Harold Hartman, tries hard to rotate volunteers to accommodate each workers schedule. Some Lions, who have the time, feel so strongly about the value of this contribution to our Club’s fund raising, they volunteer to work every week. Harold has been Bingo Chairman for over 15 years. Besides scheduling volunteers, he makes sure our Bingo operations conform to the State of Colorado gaming regulations, completing required paperwork, paying state gaming fees, picking up and depositing Bingo receipts at the Bank for each session, paying the Bingo Hall and equipment rentals, purchasing all supplies required for the Bingo operation; and, of course paying Bingo player’s winnings! By State Gaming Regulations, 100% of any profit made from Lions Club Bingo operations must be distributed to our charitable programs and activities. Volunteers work in the following assigned areas. New volunteers get “hands-on” help from other experienced Lions. 1. Callers, who call the numbers and verify each bingo winner. 2. Cashiers, who cash checks, sell the Bingo packets, pay “pickle” winners, verify all the “pickle” & specials sales and enter the numbers into the computer, and verify that the cash deposit agrees with the computer cash total is within the allowable tolerance. 3. 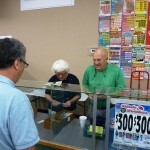 Floor Persons, who sell extra Bingo sheets (called Specials) to players after they leave the Cashiers station, and calls out the Bingo winner’s card number for verification by the Caller. 4. Special Sales Person, who maintains the records of all the floor sales. 5. “Pickle” Sales Person, who sell the “pickles” to the players an turn into the Cashiers the “cash in” and “playback” sales records for each of the different “pickles” offered for sale. Lions Bingo volunteers help cement good relations with our Bingo players and keep those players coming back. We have the reputation as the friendliest Bingo operation. There’s work involved with Bingo, but it’s enjoyable work and fellowship with Lions you don’t get attending the weekly Lions Club Meeting. We are always looking for more workers, so if you want more information, call Harold. 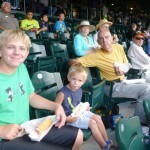 Seventeen Lions and friends attended the Rockies baseball game on July 23 against the Washington Nationals. 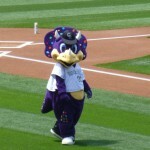 The Rockies pulled out the win and we had a great time!